Have an unforgettable Mother’s Day! 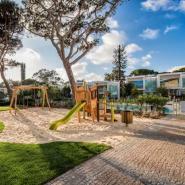 Enjoy a relaxing brunch as a family while the kids have fun at the Kids Club and playground at Martinhal Lisbon Cascais Family Hotel, an ARTEH® Hotel in Cascais. - Free access to the Kids Club and playground. - 10% Discount at Finisterra SPA (discount valid on SPA treatments not applicable to beauty treatments). - 35 EUR per adult (drinks included). - Free of charge for children up to 02 years old. - 15 EUR per child (from 03 to 09 years old). - 20 EUR per child (from 09 to 12 years old). From 06/05 to 07/05/2017 from 12 am to 5 pm.